Area Disposal Inc. provides professional and reliable services when you need to rent a dumpster for your home. We have decades of experience in the waste disposal industry, and so our drivers understand the most convenient, safest place where the dumpsters should be put. In addition to this, we have a team of experienced and highly professional drivers. With a well-maintained fleet of trucks, we not only provide roll-off services to commercial, industrial customers, but also for homeowners, we have many bilingual drivers. Why Choose Area Disposal Inc? 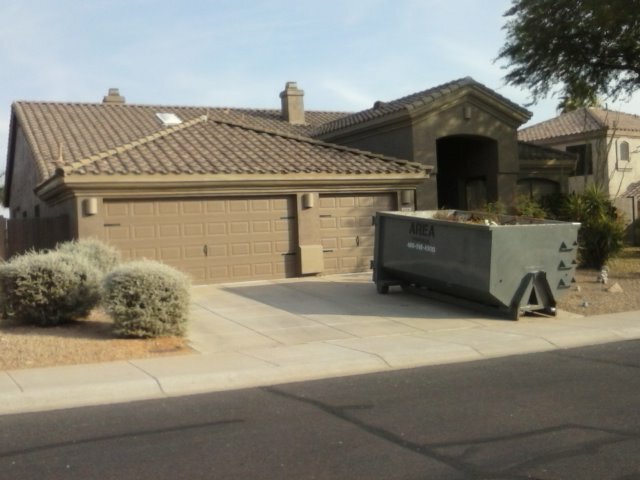 If you seek a Phoenix area trash company that comes with decades of experience, and provides an organized dumpster rental* service at competitive prices, then it’s got to be Area Disposal! Please call 480-515-4300 to reserve or email to find out more information! *Area Disposal provides complimentary dumpster usage. Charges are applicable for dumpster pick up and replacement. The term ‘Rental’ here means ‘charges for the service’. Locally Owned & Operated business serving the waste industry for 45 yrs! Looking for a Dumpster? Rent from the Professionals – Area Disposal!